My family was not what you would call literary, or even an especially bookish lot. Oh, there were books in the house—some came free with special offers at the grocery store—that’s how we got our partial set of encyclopedia (it ended at EAR–FIS); others were from the Book of the Month Club, which I think my father signed up for to get the free ones then god only knows how many peculiar titles were delivered at full price for god only knows how long before he could figure out how to make it all stop. There were also a few stolen books, mostly from schools my sister went to though I think a few came home with me from the library, permanently. All of it unintentional—I swear. And it’s not that my parents didn’t read. They did, in their own way. Apparently more when they were younger than when I knew them. My father, who could build anything, and loved the outdoors, once said his favourite book was Robinson Crusoe; my mother was the sewing, cooking, growing vegetables, hanging laundry outside kind of mother who read what she called ‘love stories’—books with pretty blonde heroines on the cover, petting horses in meadows while dark-haired men stood in the background looking confused and handsome. In any case, ours was a pitiful collection to say the least, and you can probably guess there was no encouragement toward reading, yet I gravitated to it anyway and from a very young age read whatever I could find, the way one might read every dog-eared volume on a dusty plywood shelf while stranded in a cabin for a rainy week a million miles from anywhere. In other words, grateful for anything. Best part in cases like that: sometimes you find a gem or two in the debris. My own possibly pilfered, possibly purchased copy. 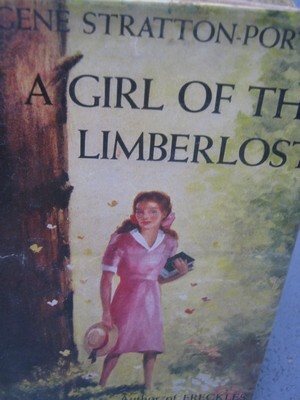 One of the highlights on our shelves was A Girl of the Limberlost, by Gene Stratton-Porter, which is stamped with the name of a local school but has a price of $2.50 marked inside in pencil. So it may have been one of the few acquired legitimately. I read it at about ten, eleven, twelve years old, I’m not sure, but I remember connecting immediately with Elnora Comstock who wore hand-me-down clothes and lived in the woods communing with nature when she wasn’t arguing with her mother. I didn’t live in the woods but I wanted to. I can still practically smell the spice cakes her mother packed in the bucket that carried Elnora’s lunch to school. And I remember how those cakes were one of the few but important signs of her mother’s otherwise unexpressed love. I’ll have to read it again to be sure but I don’t believe Stratton-Porter sentimentalized the mother’s role in any way, which to me was refreshing. A change from all those love stories cluttering up the house, the Cherry Ames, Student Nurse, and books where everybody was so bloody happy and the only problem was something outside the family—a ghost in the vestibule, a murder in the vicarage, etc. Yeah, right. It was, I suppose, my first character driven story, one that suggested interior journeys were possible in literature, that it wasn’t all about ‘the other’, meeting someone who changed your life after a series of predictable problems, or climbing the mountain, or solving the murder. All this reflection, BTW, came as a result of stumbling across a short video at The Guardian. Before that, I hadn’t given ‘the first book’ much thought, nor its many and varied influences on me (too introspective to rattle on about). Maybe the sort of thing that requires a certain age and perspective in order to see it clearly. Anyway, it’s all got me thinking that it’s probably quite often, maybe even always, a book, rather than a person or even an environment, that nudges us around a corner of our early reading. That maybe the love of words is a nature rather than nurture affair, in our DNA, and it’s just a matter of time before we find that book that connects with an inherent understanding or curiosity about the world—and reflects it back to us. True, if we’re surrounded by people who bring us sacks of lovely things to read we may find it sooner, but even if we’ve got nothing but a dusty shelf in a cabin, I’m convinced we will find it. And then off we go. Never to be the same again. And more ourselves than ever. Funny how stuff begets stuff. So, latest dinner party question: what was the first book that made you think differently about books? When I was a kid we had a big bookcase with all sorts of books. Mine was not a particularly literary family either, so I’m not sure whose books they were or how we got them. But I used to love looking at the spines and reading the rows of titles, which included Zorba The Greek (the name Kazantzakis fascinated me), Nine Hours To Rama (which I think was about the assassination of Ghandi), and Tropic Of Cancer. Of course I eventually dog-eared a few particular pages of that one. I read only two books in high school – Catcher In The Rye and The Apprenticeship Of Duddy Kravitz – both very influential on me. I didn’t start reading in earnest until my twenties. I guess the first book that made me think differently about books was Coming Through Slaughter by Michael Ondaatje. The prose style was so odd and fascinating. When I made my first stab at writing a story I consciously copied that style. Amazing that you remember what was on the shelves, the look of those spines. That’s such a powerful image. Obviously, even though you weren’t reading the books, something was happening, your innate bookishness was kicking in.